Stable angina is chest pain or discomfort that most often occurs with activity or emotional stress. 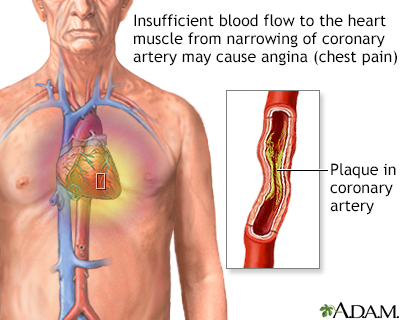 Angina is due to poor blood flow through the blood vessels in the heart. Your heart muscle needs a constant supply of oxygen. The coronary arteries carry oxygen-rich blood to the heart. When the heart muscle has to work harder, it needs more oxygen. Symptoms of angina occur when blood supply to heart muscle is reduced. This happens when the coronary arteries are narrowed or blocked by atherosclerosis or by a blood clot. The most common cause of angina is coronary artery disease. Angina pectoris is the medical term for this type of chest pain. Stable angina is less serious than unstable angina, but it can be very painful or uncomfortable. The coronary arteries supply blood and oxygen to the heart. Coronary artery spasm is a brief, sudden narrowing of one of these arteries. Symptoms of stable angina are most often predictable. This means that the same amount of exercise or activity may cause your angina to occur. Your angina should improve or go away when you stop or slow down the exercise. The most common symptom is chest pain that occurs behind the breastbone or slightly to the left of it. The pain of stable angina most often begins slowly and gets worse over the next few minutes before going away. Some people say the pain feels like gas or indigestion. Angina attacks can occur at any time during the day. Often, they occur between 6 a.m. and noon. You may need to take one or more medicines to treat blood pressure, diabetes, or high cholesterol levels. Follow your provider's directions closely to help prevent your angina from getting worse. Nitroglycerin pills or spray may be used to stop chest pain. Anti-clotting drugs such as aspirin and clopidogrel (Plavix), ticagrelor (Brilinta) or prasugrel (Effient) can help prevent blood clots from forming in your arteries, and reduce the risk of heart attack. Ask your provider if you should be taking these medicines. Angiotensin-converting enzyme (ACE) inhibitors are medicines. They treat heart, blood vessel, and kidney problems. NEVER STOP TAKING ANY OF THESE DRUGS ON YOUR OWN. Always talk to your provider first. Stopping these drugs suddenly can make your angina worse or cause a heart attack. This is especially true for anti-clotting drugs (aspirin, clopidogrel, ticagrelor and prasugrel). Your provider may recommend a cardiac rehabilitation program to help improve your heart’s fitness. Some people will be able to control angina with medicines and not need surgery. Others will need a procedure called angioplasty and stent placement (also called percutaneous coronary intervention) to open blocked or narrowed arteries that supply blood to the heart. Blockages that cannot be treated with angioplasty may need heart bypass surgery to redirect blood flow around the narrowed or blocked blood vessels. Stable angina most often improves when taking medicines. Get medical help right away if you have new, unexplained chest pain or pressure. If you have had angina before, call your provider. Get medical help right away if a person with angina loses consciousness (passes out). A risk factor is something about you that increases your chance of getting a disease or having a certain health condition. Some risk factors for heart disease you cannot change, but some you can. Changing the risk factors that you can control will help you live a longer, healthier life. Morrow DA, de Lemos JA.. Stable ischemic heart disease. In: Zipes DP, Libby P, Bonow RO, Mann DL, Tomaselli GF, Braunwald E, eds. Braunwald's Heart Disease: A Textbook of Cardiovascular Medicine. 11th ed. Philadelphia, PA: Elsevier; 2019:chap 61. Whelton PK, Carey RM, Aronow WS, et al. 2017 ACC/AHA/AAPA/ABC/ACPM/AGS/APhA/ASH/ASPC/NMA/PCNA guideline for the prevention, detection, evaluation, and management of high blood pressure in adults: executive summary: a report of the American College of Cardiology/American Heart Association Task Force on Clinical Practice Guidelines. J Am Coll Cardiol. 2017; S0735-1097(17)41518-X PMID: 29146533 www.ncbi.nlm.nih.gov/pubmed/29146533. Angina is a specific type of pain in the chest caused by inadequate blood flow through the blood vessels (coronary vessels) of the heart muscle (myocardium).